Students develop an understanding of the meanings of multiplication and division of whole numbers through activities and problems involving equal-sized groups, arrays, and area models; multiplication is finding an unknown product, and division is finding an unknown factor in these situations. For equal-sized group situations, division can require finding the unknown number of groups or the unknown group size. To me, it seems that the emphasis is on "equal-sized groups," "same-size units of area," "identical rows," and "identical columns." The child's teacher could have emphasized this in class. 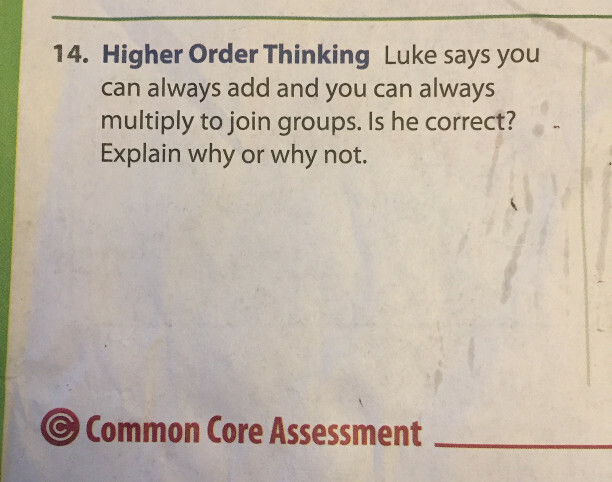 If so, then perhaps one "valid" answer to this higher-order thinking question is "You can add objects together if they belong to the same group. You can multiply groups of objects if they are of the same size." For example, say that students are riding in $3$ buses: one bus has $30$ students, another has $30$, and another has $32$. How many students are there in total? The answer is not $30+30+32+3$, that is, the number of buses is not added because buses are not students. The answer is not $30\times 3$, because not all the buses have exactly $30$ students. Not the answer you're looking for? Browse other questions tagged primary-education or ask your own question. What was the problem with New Math? Why did it end? Is there a name for 'simple' two-input-one-output word problems? Systems of linear equations in grade 3?